Wash all dals together in a big bowl and soak them in plenty of water for around 1-2 hours. Add a little salt in water and pressure-cook them for 4 whistles. Heat ghee in a deep pan and add cumin seeds along with hing. Once it stops crackling, add chopped onions and ginger-garlic paste. Saute it till onions are translucent. Add chopped tomato and all the spices and mix them well. Cook it for around 2-3 minutes. Without draining excess water from pressure-cooker, add all dals in pan and mix well. At this point of time, add some hot water if required. Cover it with a lid and cook it for 5-6 minutes more. This goes very well with Baati, Khooba Roti or Steamed Rice. Have you seen other dal recipes? 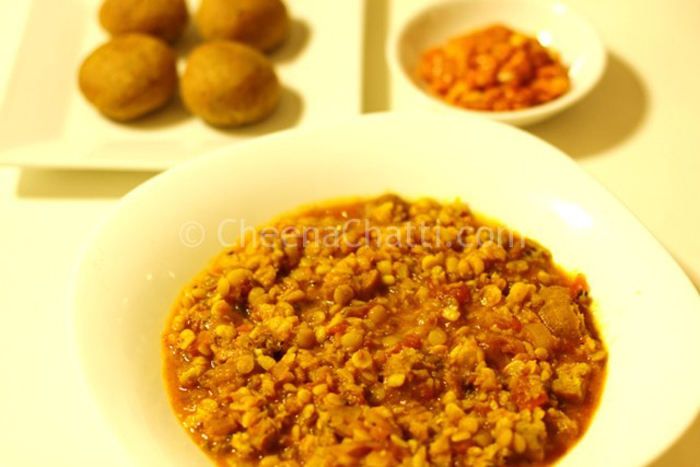 This entry was added on June 12th, 2013 by SJ in Vegan and tagged with lentils, panchmel dal recipe, rajasthani, panchmel dal show me the curry, panchmel dal recipe tarla dalal, make panchmel dal, dal recipes, vegetarian, dal. Last revised on March 27th, 2018.